James Calvin Hinchey3,5,9 [James Calvin Hincher1, Calvin Hincher10, Calvin Hinchy11]. Hincher, James, head-of-household, age 22, born May 1878 in North Carolina; parents born in North Carolina; married 3 years; farmer. Hincher, Tipie V., wife, age 24, born June 1875 in North Carolina; parents born in North Carolina; married 3 years; 2 children, 2 living. Hincher, Dana E. [unclear], daughter, age 2, born Jan 1898 in North Carolina; parents born in North Carolina. 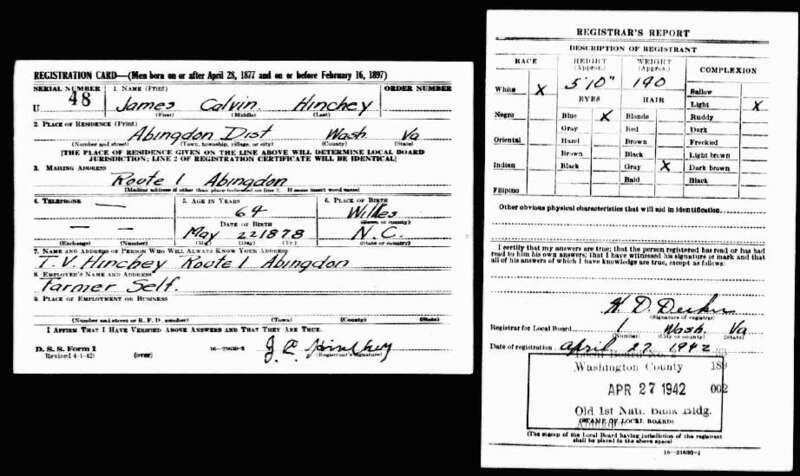 Hincher, Chelie, son, age 2 months, born Mar 1900 in North Carolina; parents born in North Carolina. Hincher, Marth A., sister, age 17, born Oct 1882 in North Carolina; parents born in North Carolina. Mahaffey, Frank C., head-of-household, age 74, born in Virginia; parents born in Virginia; widower; occupation: farmer, general farm; owned farm. Hinchey, James C., hired man, age 31, born in North Carolina; parents born in North Carolina; first marriage, married 13 years; occupation: laborer, farm. Hinchey, Victory, hired woman, age 33, born in North Carolina; parents born in North Carolina; first marriage, married 13 years; 6 children, 6 living; occupation: cook, private family. Hinchey, Ethel, lodger, age 12, born in North Carolina; parents born in North Carolina; attended school. Hinchey, Chella A., lodger, age 10, born in North Carolina; parents born in North Carolina; attended school. Hinchey, Stanley S., lodger, age 8, born in Virginia; parents born in North Carolina. Hinchey, William [unclear], lodger, age 6, born in Virginia; parents born in North Carolina. Hinchey, John, lodger, age 4, born in Virginia; parents born in North Carolina. Hinchey, Trula [unclear], lodger, age 2, born in Virginia; parents born in North Carolina. Hinchey, James C., head-of-household, age 44, born in North Carolina; parents born in North Carolina; rented home; farmer. Hinchey, Tipie V., wife, age 46, born in North Carolina; parents born in North Carolina. Hinchey, Dione [name unclear, middle initial unclear], daughter, age 22, born in North Carolina; parents born in North Carolina. Hinchey, Chelle A., son, age 19, born in North Carolina; parents born in North Carolina; married. Hinchey, Stanley, son, age 18, born in Virginia; parents born in North Carolina; single. Hinchey, Fletcher, son, age 15, born in Virginia; parents born in North Carolina; single; attended school. Hinchey, Quincy, son, age 14, born in Virginia; parents born in North Carolina; single; attended school. Hinchey, T[..unclear..], son, age 11, born in Virginia; parents born in North Carolina; single; attended school. Hinchey, Rudy Howard, son, age 8, born in Virginia; parents born in North Carolina; single; attended school. Hinchey, Martha, daughter, age 5 [unclear], born in Virginia; parents born in North Carolina; single. Hinchey, Helen Virginia, daughter, age 4, born in Virginia; parents born in North Carolina; single. Hinchey, Clara, daughter, age 1 month [unclear], born in North Carolina; parents born in North Carolina; single. Hinchey, Eunice, daughter-in-law, age 20, born in North Carolina; parents born in North Carolina; married. Hinchey, James C., head-of-household, age 50, born in North Carolina; parents born in North Carolina; first married at age 19; occupation: farmer, general farm; not a veteran. Hinchey, Tipie V., wife, age 52, born in North Carolina; parents born in North Carolina; first married at age 21. Hinchey, Martha J., daughter, age 17, born in Virginia; parents born in North Carolina; occupation: servint [sic], privet [sic] family. Hinchey, Boby H., son, age 19, born in Virginia; parents born in North Carolina. Hinchey, Helen V., daughter, age 14, born in Virginia; parents born in North Carolina. Hinchey, Clara L., daughter, age 10, born in North Carolina; parents born in North Carolina; attended school. 1900 census, Mulberry Township, Wilkes County, North Carolina; ED 152, page 594B, line #70, dwelling #316, family #319. 1910 census, Abingdon District, Washington County, Virginia; roll T624-1651, ED 124, page 144B (Sheet 8B), line #52, dwelling #117, family #123. 1920 census, North Wilkesboro, Wilkes County, North Carolina; roll T625-1329, ED 179, page 2A, line #1, dwelling #23, family #24. Contribution from Linda & Harold Hinchey. 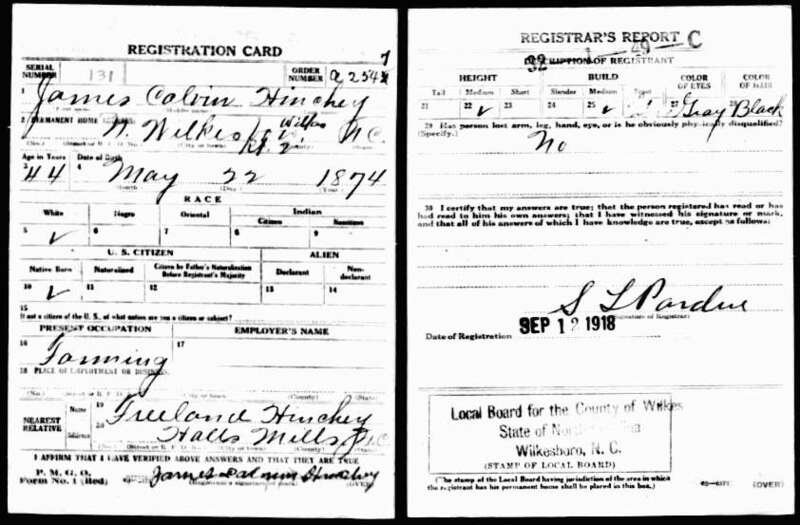 Wilkes County, North Carolina marriage record. 1930 census, Abingdon, Washington County, Virginia; roll T626-2463, ED 3, page 9A, line #23, dwelling #153, family #164. Obituary of Clara Lee Hinchey. Telephone interview Jul 18 2003 with Ambrose Milton Hincher. burial records, Mountain View Methodist Church Cemetery, Abingdon, VA.
information from daughter of Helen Virginia Hinchey. 1930 census, Abingdon District, Washington County, Virginia; roll T626-2463, ED 3, page 9A, line #23, dwelling #153, family #164. 1880 LDS census index, Mullberry Township, Wilkes County, North Carolina; roll T9-0987, page 75D. 1930 census, Abingdon, Washington County, Virginia; roll T626-2463, ED 3, page 9A, line #29, dwelling #154, family #165. 1930 census, Abingdon, Washington County, Virginia; roll T626-2463, ED 2, page 11A, line #44, dwelling #215, family #216.